Cape Town. Day 1. After an eleven hour overnight flight and not much sleep, we arrived at 5.30am at our hotel in the city centre. We all went to bed and had three hours sleep before cleaning up and going to the Victoria and Alfred waterfront for lunch. Felt much better after, and had a wander around the boats and docks. Very touristy. We got a bit confused because the sun was in the wrong place (North). 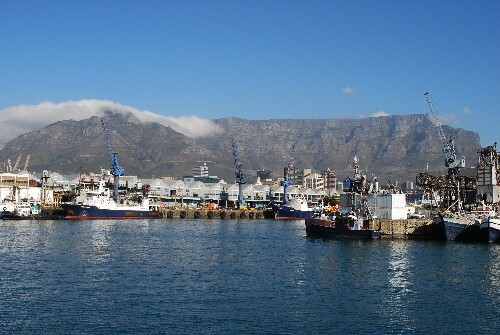 Table Mountain. Day 2. We took the revolving (scary) cablecar up to the mountain. About 1km above sea level, incredibly high and great views but fearsome drops. Floss & Max hunted lizards. Aquarium. Day 3. Drove out to Somerset West for Max's tennis lesson with Pierre. Then back to V&A to the aquarium. Brilliant: Species from Indian and Atlantic oceans, kelp forests, sharks,rays, clown fish (Nemo), giant spider crabs and much more. Coast and Robben Island. Day 4. In the morning we drove south along the coast, stopping at beaches at Clifton #3 and Llandudno. Beautiful coastline, pristine white sand, clear Atlantic sea. F&M had to go in! Still not quite as lovely as Whipsy at low tide, but v close second (and warmer). Robben Island lies 12km off the mainland. We took a catamaran ferry to the island, on the way we glimpsed a whale surfacing. On the island, we had a tour of the maximum security prison, and saw cell no.4 where Mandela was imprisoned for 18 years, finally released in 1990. A former political prisoner was our guide and gave us a real insight to life on the island. On the way back to the mainland we saw another whale surfacing, exciting stuff! Townships, Day 5, We took a private township tour with a local, called Ronnie, his full time occupation is a Preacher. The tour included three different township areas, Langa, the oldest township, Nyanga and Khayelitsha, the newest where over 2 million people live. The inhabitants mainly live in small ramshackle huts made from corrugated iron and put up by themselves. We visited and met a lot of locals including a community centre dedicated to helping the unemployed by teaching art and pottery and a local nursery, where Floss and Max met the pupils. We also went to a shebeen (a township tavern) which was a really smoky den. Floss and Max were most impressed with the sheep's heads which were sold on the street (Ronnie showed us how they 'smile' when they are put in the fire to cook as their lips curl up in the flames)! Nice.